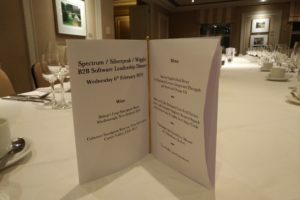 On the evening of 6th February, Spectrum, Silverpeak, the technology investment bank, and Wiggin, the technology law firm, co-hosted a B2B Software Leadership Dinner. We brought together 20 senior executives and board members for a ‘Chatham House rule’ discussion on the B2B software landscape during a private dinner in Central London. I just wanted to drop you a line by way of thanks for your hospitality at last night’s event. You had a first class group of guests and I found the resultant discussion to be of considerable value. I can only hope that I was able to add to the quality of debate. There are already a few areas of follow-up with some of the people I met there: thank you for being the facilitator of this.